Turn the clock back twenty years to the mid-Nineties: Coca-Cola (NYSE: KO) was dominating the world of soft-drinks and had done for years. The business was in great shape and the stock had delivered phenomenal returns over the past several decades, compounding at a double digit rate. Such a business would surely be expected to produce good returns going forward all else being equal, yet the stock went on to have an exceptionally poor run over the following twenty years by historical standards. Fast forward back to the present day and let’s look at what a $10,000 investment in Coca-Cola would have actually generated in terms of returns. Were Coke’s lost two decades really as bad as they look on paper? Firstly, let’s just look at a straightforward consideration of the share price appreciation. At this point in 1996 you were paying a split adjusted price of $20.80 for a single share of the company. A $10,000 investment would’ve therefore netted you a total of 480 shares in The Coca-Cola Company. Twenty years later those shares would now have a total value of about $22,500 – equating to compounded annual share price growth of 4.15%. By way of comparison the S&P 500 delivered just over 6% compounded annual returns over the same period. Okay, so that might look a bit disappointing to our investor considering that over this period the fundamentals of the business have remained intact. After all that 1.85% a year underperformance adds up a lot when you’re talking about compounding it over a couple of decades. On the plus side Coca-Cola remains an absolute profit machine, just as it did back in the mid-nineties, and as it has done for many, many decades thorough wars, recessions, depressions and pretty much everything else that has happened since the stock went public 1919. Check out the performance of the underlying business in the early to mid-1990’s. Revenue growth clocked in at 9% compounded annually; net income was growing at a double digit clip; earnings per share had almost quadrupled since the late 1980’s and the dividend distribution had more than trebled. By all accounts Coca-Cola’s business was firing on all cylinders. As we know, the reason for our investor’s disappointment is a lack of appreciation for Coca-Cola’s market value in 1996 and how much he was paying relative to his share of the company’s profits. Let’s say our investor scanned the price-to-earnings ratio just after his purchase of Coke stock. Had he done so he would have seen that the shares were trading at 34x their prior year earnings. That’s insanely expensive given that Coke would not only need to keep up that past growth rate, but also increase it in order to justify that valuation. Today the stock is trading somewhere in the region of 23x earnings, so still quite expensive in historical terms. What it does show though is that we have had a significantly large contraction of the earnings multiple over that time frame which has eaten into our investor’s capital appreciation. Of course the above is presenting only part of the history of Coke’s returns for the past couple of decades. After all the dividend machine remained in full and increasing cash spewing mode over that period. So let’s run the second scenario and assume our investor lost the password to his broker account and the dividends just kept on accumulating. They ended up sitting in the account, but not being reinvested into more Coke stock or any other investments either. Had that scenario unfolded then the total cash dividends from Coca-Cola sitting in the broker account would have amounted to $6,410. So to sum up we have $22,250 in Coca-Cola stock, plus an additional $6,410 in dividend cash, which makes a total return of $28,660 on the initial $10,000 investment. On a compounded basis that works out to 5.4% annual returns. Suddenly it starts to look a tiny bit better for our investor even though in hindsight they picked a pretty poor starting value in which to invest. The final scenario is to assume that before our investor forgot the account password they at least managed to change the settings to automatically reinvest any dividends back into more Coca-Cola stock. 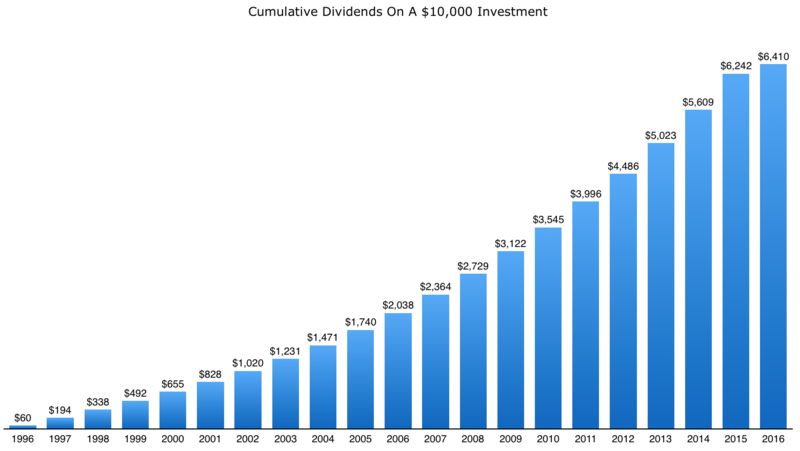 In this case the returns amount to an investment value of $35,250 – which works out to 6.5% compounded annual returns, and a 1% a year increase compared to just letting the dividends accumulate. Now the performance doesn’t look too bad overall. Okay, so it underperformed the S&P 500 which has delivered average annual returns of just under 8% including dividends over the same time frame. There are a couple of additional points to consider here though. Firstly, the starting market value of the stock was insanely expensive relative to the future growth potential of the company. Indeed the stock topped out only two years later, meaning dividends were being reinvested into even more overvalued stock for two whole years. Secondly, the share price didn’t actually hit the bottom until five years after that. So our investor was actually looking at seven years before the stock even started to approach a reasonable valuation. That’s a good chunk of the twenty year time frame just spent in the wilderness of dead money territory. It might seem painful at the time, but putting money to work, even just reinvesting dividends, in periods where the share price is going sideways can have a huge impact in terms of returns twenty years down the line. All things considered beating inflation by 3 percentage points every years isn’t such a bad outcome at all. A fact which was made possible because the underlying business continued to be the profit machine that it has been historically.